I'm a fan of Care Bears. I have been since I was three. I remember collecting all of the Care Bears, and the Care Bear Cousins, and even the cloud mobiles! Like all good things, though, Care Bears came to an end. But! The Care Bears are back! The characters have been revamped, but the story lines remain the same. 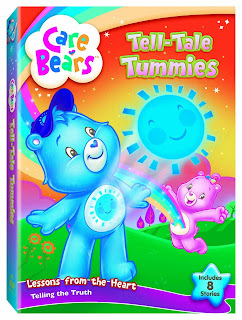 In the newest DVD release, Care Bears:Tell-Tale Tummies, kids learn about telling the truth and making friends. Each of the eight episodes takes you on a new adventure with the Care Bears, and teaches kids how to resolve their problems using their words. I'm so excited to share the Care Bear family with my own, I know that my kids will love it just as much as I did. You can find the DVD at your local retailer, or you can order it online.